A pasta with fruit. You can make a pasta using strawberries or peaches almost the same way you make it with fresh cherry tomatoes. 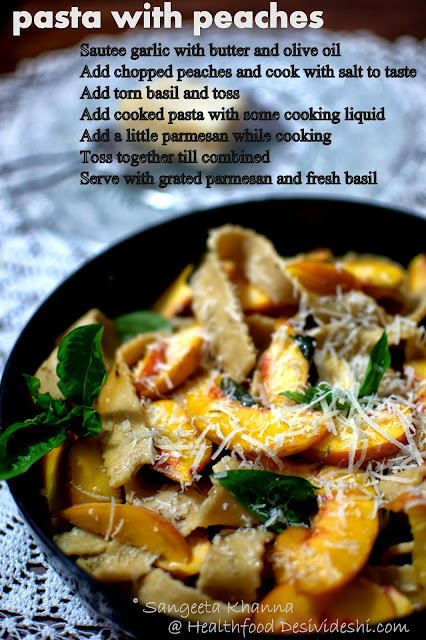 Use fresh herbs, slightly sweet and tart fruits, cheese of your choice and you are good to go with a nice flavorful fruit based pasta dish. Please do tell me if you like it. Mmmmm..this seems like a real treat. Would it work with apples? I haven't tried pasta will apples as yet Corinne. Any sweet and tart fruit that gets mushy after cooking will be good for it. Strawberries, plums and peaches I have tried and these were nice. ahha!! this looks lovely!!! Peaches, parmesan n pasta, call it Triple-P!! !